"One? Sit!" A man waves at me gruffly. I obediently plonk myself into a child-sized plastic chair, bringing my knees level with my shoulders, at a stall on a street corner in District 1 in Ho Chi Minh City, Vietnam, having walked for 45 minutes in 36°C heat to eat at an unassuming roadside cart. I'm really hoping it's going to be worth it. So far, things are looking promising. It's only just gone 11am and my seat may be on the small side, but I'm thankful for it: everyone behind me has to queue. The Lunch Lady Saigon's noodle soups are the stuff of legend, and the Lunch Lady herself is practically a celebrity – and that was even before she appeared on the late Anthony Bourdain's show No Reservations in 2009. From my (low) perch I inspect the Lunch Lady's trolley, piled high with prawns, thinly sliced pork and a giant pile of thick, pinkish, opaque and gelatinous wriggly things that I regard with trepidation, until I realise they're the famed noodles themselves. 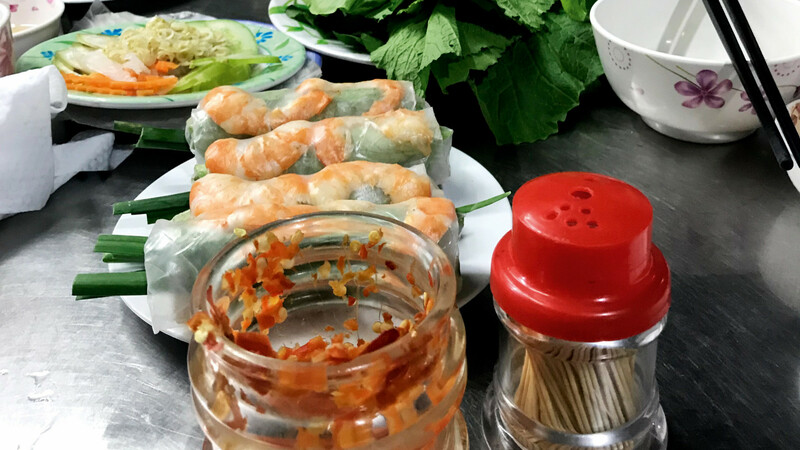 Her team bring me starters: goi cuon, or summer rolls: cylinders of herbs, prawns, spring onions and skinny vermicelli rice noodles, tightly swaddled in rice paper. Crunchy and fresh-tasting, they're the perfect antidote to the heat and humidity, and I rapidly munch my way through them, dipping them into tamarind and chilli sauces. And then it's time to eat what I've braved the soaring temperatures – and HCMC's infamous traffic – for. On the menu today is bun moc, a light clear broth packed with porky treats. Come here on another day, however, and you'll find another soup on the menu, as the Lunch Lady has a daily-changing menu that rotates throughout the week, something that's considered unusual when it comes to street food. A bowl topped with a giant pile of fresh green herbs is dumped on the table. With the Lunch Lady herself standing over me, I go on a fishing expedition, clumsily using my chopsticks to navigate through my soup and pluck out bits of boiled pork, meatballs and slices of pale, delicate meatloaf. "Ngon", I say in rudimentary Vietnamese. It's the only word I've mastered – ”delicious”. She laughs and beckons over the other people who help her run the stand. They all watch me eat as I occasionally mutter ngon in an enthusiastic, if slightly deranged, manner. But the soup is more than worthy of my praise. The meat, boiled for hours, is tender; the noodles have just the right amount of bite; and a smattering of crispy onions adds crunch. The broth is rich, but not overly so. It's an umami-laden potion, with a perfect balance of sweet and sour. 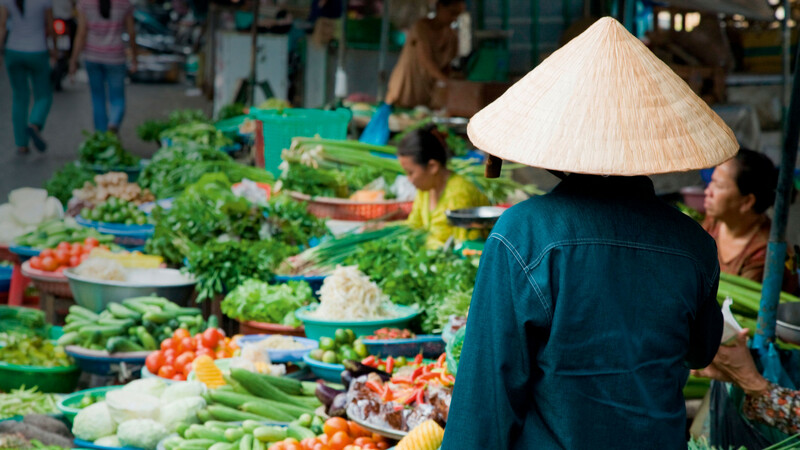 This 'balance' is what Vietnamese food is so famous for, to the point that Vietnamese food is considered to be some of the best in the world. 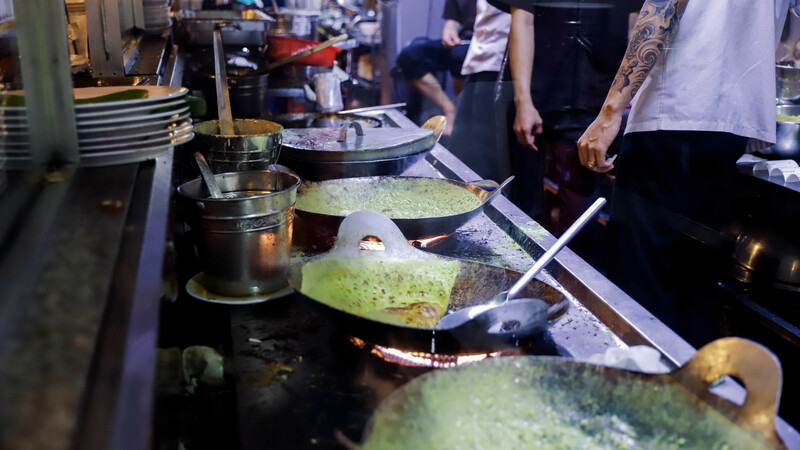 In London, we love it too – Kingsland Road's many hole-in-the-wall Vietnamese restaurants are proof of that. There, you'll find a whole street of them, the kind of no-frills joints with plastic menus featuring photos of the food, where a meal and a beer is unlikely to set you back more than 15 quid, and there are always bums on seats. But even within Vietnamese cooking, the country's street food holds its own celebrated place, and my quest to understand just what makes it so special has led me on a pilgrimage all the way to the streets of Ho Chi Minh City. Vietnam's biggest city is an intoxicating metropolis, filled with noise, people, neon lights… and scooters. Accompanied by my guide, Anna, I pass along wide boulevards lined with towering trees, one of the vestiges of the French occupation in the 19th and 20th centuries. Anna tells me sadly these trees are now being cut down and replaced with smaller ones. She takes me to the post office – her favourite building – a beautiful French-style construction dating from 1896, with its stunning black and white tiling on the floor and two iconic painted maps; the 1960s-style Reunification Palace; and we drive past the Bitexco Tower, which reminds me of Tony Stark's monolith in The Avengers. These contrasts – Communist minimalism, modern skyscrapers, old-school low-rise buildings – are Ho Chi Minh City in a nutshell, where tradition meets modernity with a crash, and in amongst it all survive flourishes of French elegance. Not least the food. 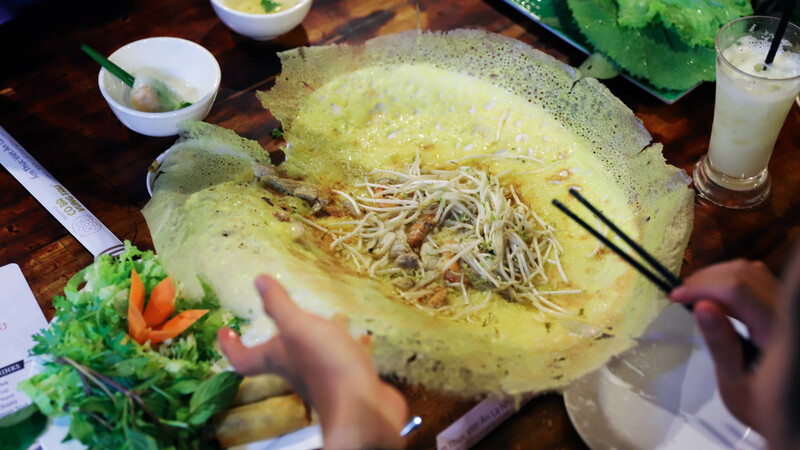 I join a street food tour with Vespa Adventures (which, in case you needed the explanation, takes you on a tour on the back of a Vespa), and one of our first stops is a place called Bánh Xèo, serving, er, bánh xèo, pancake-like creations that are a barely recognisable nod to the French crepe. Rice flour and coconut juice form the batter, which gets ladled into an enormous cast iron pan that sizzles above an open flame. Prawns (shells left on for added calcium in a non-dairy-eating country), pork, mung beans, bean sprouts and dash of turmeric are thrown in, and then the whole thing is flipped over like an omelette before being slid out onto a plastic plate. My guide, Jaden, shows me how to eat the xeo: cut the 'pancake' into manageable chunks, lay one on a piece of rice paper, choose your herbs – it's served with giant wasabi leaves, Vietnamese basil, mint, perilla (a Japanese influence) and something called fish mint that does indeed smell, well, fishy – roll it all up and away you go. The result is crispy, fatty and glorious, and, in my opinion, knocks a crepe straight out of the park. But it's these herbs – larger, more fragrant and flavoursome than the ones you find here – that, for me, really cinch the deal when it comes to Vietnamese cooking, adding a vibrancy to the dishes that we just can't replicate at home. Our next stop reveals another culinary French hangover: jumping chicken – frog's legs – fried in sweet chilli sauce. I also sample razor clams topped with diced fresh chilli and herbs, delicately tweezing the flesh out of the shells with my chopsticks. By the hordes of people around me, it's evident that street food is a crucial part of life in Ho Chi Minh City, and I ask Jaden why that is. Sat in the street on yet another surprisingly small plastic chair, I watch scooters zoom past, squeezing through improbably small gaps with impressive dexterity. It's hot and humid, neon signs flash in the darkness, and under the sound of people's chatter I can hear the roar and sizzle of food being cooked at the roadside. It should be overwhelming for the senses, but instead I feel energised, and end the night with my belly full and my mind buzzing with Ho Chi Minh's vibrant street culture – and knock-your-socks-off strong iced coffee. The next day starts with pho (pronounced 'fuh'), the Vietnamese classic you'll find on menus at most Vietnamese joints in London. Here, it's eaten for breakfast, with either shredded chicken or thinly sliced beef, plenty of fresh herbs and hot sauce. I hop on another scooter – this one booked through Uber for a matter of pennies – and make my way to the famous Ben Thanh market in District 1 to meet Anna. In amongst a rainbow of rip-off Fjallraven Kanken backpacks, I eat banh beo hue, a dish of tiny little steamed rice pancakes served with pork crackling, shrimp, mung beans and a mind-blowing sour and sweet broth that comes from Vietnam's central region. Anna tells me that sourness is crucial to Vietnamese cooking, and it's achieved through different means around the country: in the south, tamarind is a key ingredient; the north uses fermentation; while the central region relies on different fruits. Up next on my food hit list is the famous banh mi sandwich – a French-Vietnamese mash up of a small baguette stuffed with pickles, cucumber, chillies, coriander and your choice of protein, although slices of pork are most common, as are wedges of French-ish paté. I amble back towards my hotel along streets lined with leafy courtyards and shaded corners. I'm full, but I still stop to pick up something that looks like an enormous dumpling sprinkled with sesame seeds. I take a bite and discover tender pork and two quails eggs. Lydia travelled as a guest of Inside Asia Tours. 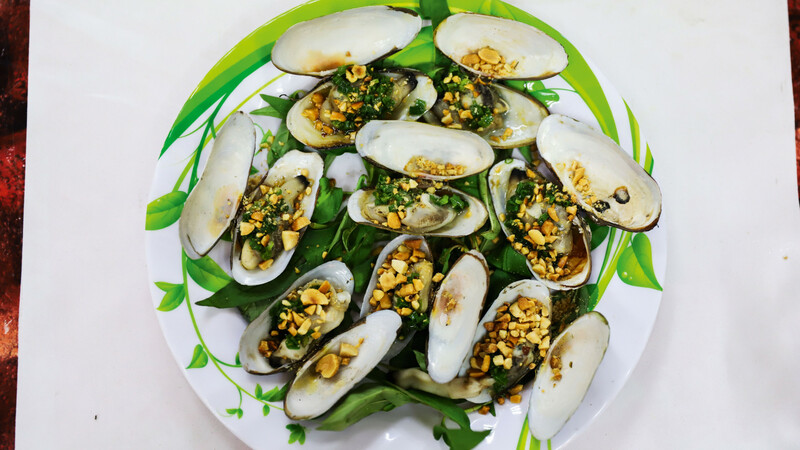 To take a deeper dive into Vietnam’s cuisine, Inside Vietnam offers a new 13-night ‘Gastronomic Trails of Vietnam’ tailored trip which includes a range of foodie experiences including home cooking with chef Ai in Hanoi, a Vespa Street Food tour in Ho Chi Minh City, salt rice meal with a master in Hue, farming in Ky Son and more. Cost from £2,995pp (exl international flights). insidevietnamtours.com. 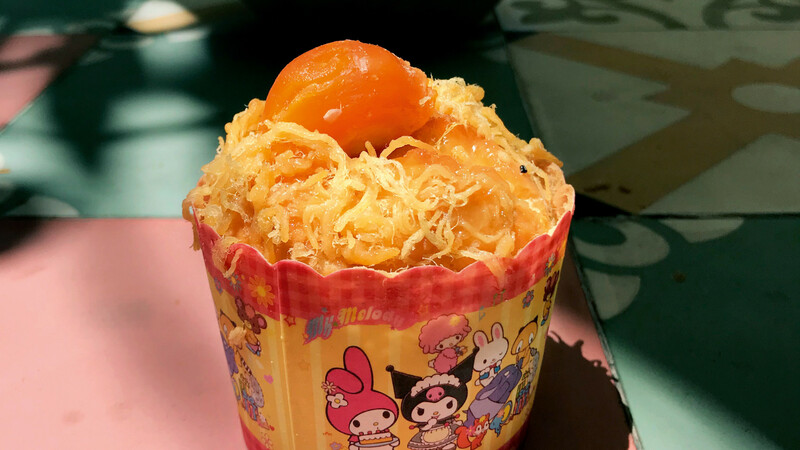 And finally, my sweet tooth guides me to some golden-hued cupcakes, topped with something that looks like crunchy candy floss and a perfect orange-yellow orb of cured egg yolk. It's possibly the weirdest but most delicious discovery of my trip: the sponge is springy and moist; the floss is made with pork – an insanely moreish salty-sweet topping that offsets the fattiness of the egg. 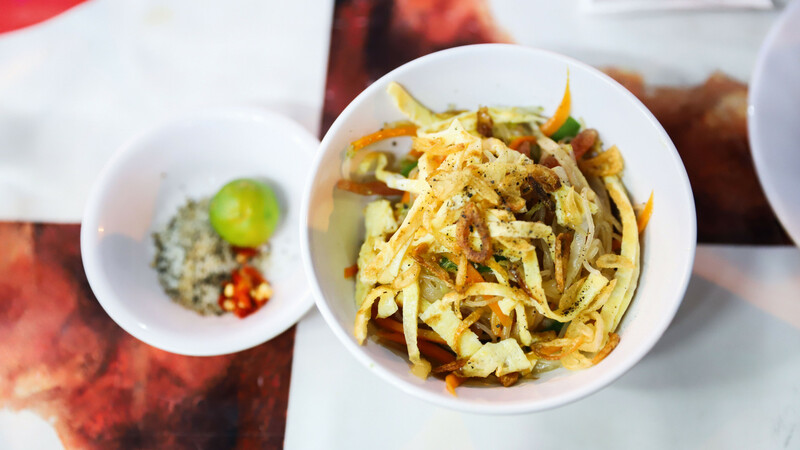 I leave Ho Chi Minh City feeling like I've barely scratched the surface of its vast, varied cuisine. I compare it to what we have in London, where street food is polished, not exactly inexpensive, eaten in covered markets with a craft beer or a cocktail, and has only sprung to the fore again in the past five years or so. 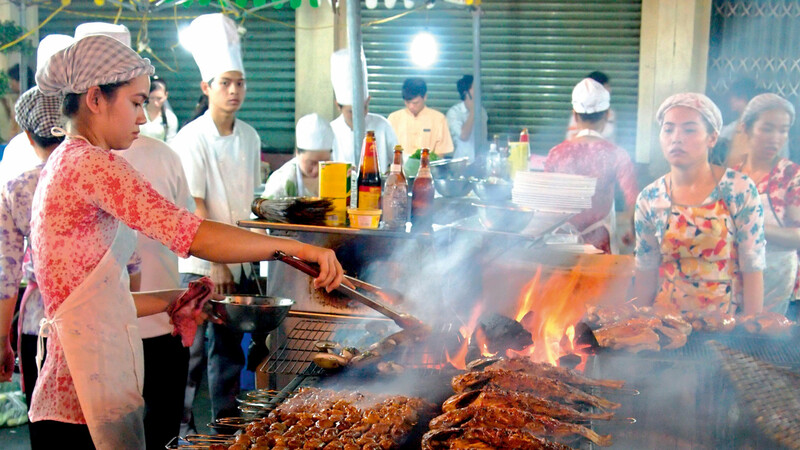 In Ho Chi Minh City, for both those that cook it and those that eat it, street food comes first and always has done – and that's probably what makes it taste so good.